Brew the green tea with lemon myrtle leaves for 3-5 minutes, remove the tea bags and cool. 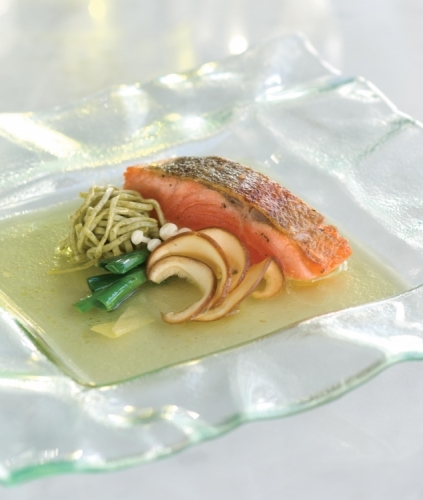 Combine all the ingredients, gently coat each individual portion of ocean trout with the mixture, except for the skin. Wrap each piece in the muslin cloth and secure with butcher’s twine, carefully. Place each piece into the cooled green tea with lemon myrtle infusion making sure that the skin stays above the surface, cover and refrigerate for 24 hours. The longer the trout ‘steeps’ the more intense the flavour will become. Process flour, salt and green tea. Add the beaten eggs and spinach water while still processing. Remove from processor and knead on a lightly floured surface to bring the dough together. Cover and rest for 30 minutes. For the next step you will need a pasta machine. Roll out 6 cut sheets into 4 inch lengths and then put through the spaghetti attachment. Cook in a large pot of salted water for approximately 1 minute. Strain, slightly cool, divide the noodles into four and using a fork or carving fork, twirl the noodles into individual bundles. Place onto a tray, cover and refrigerate. Remove trout from green tea reserve and unwrap, carefully scrape away the bonito flakes and spring onion tops. Pat dry and sprinkle a small amount of sea salt onto skin. Heat a frying pan until hot, add a little ghee then place the ocean trout skin down. At this stage gently hold the fish down for approximately 15 seconds using a spatula (this will stop the trout skin from contracting and the result will be a crisp, toffee like finish). Continue to cook on a moderate heat for 1-2 minutes, carefully turn over and let the fish ‘rest’ in this pan in a warm area until ready for use.